Thor: Ragnarok will be getting two different Lego sets which is great because I was worried that with Guardians getting 3 that Lego would only do 1 for Thor. I know that logic is not entirely valid it just seems like when Lego goes all out for one film the next film will get less focus. The sets give us an idea on the colors being used in the film as well. The film seems to use very strong and bold uses of primary colors like red and blue in the Arena and Red and Yellow in the spacecrat in the Ultimate Battle for Asgard. There are some great minifigures in both sets. The two that stand out the most to me are the Hela figure in Ultimate Battle for Asgard and the Gladitorial Hulk in Thor Vs. Hulk Arena Clash. This set includes a lot of really cool minfigures that includes the epic minifigure of Hela. Look at that figure that is pretty awesome. Actually all of the minifigures in this set are pretty cool, even Bruce Banner in human form is different. The Thor figure here comes with the ability to fire a power blast and this is the first (and only) set that includes the figure of Valkyrie. She is hard to make out in the picture above because she is piloting the space craft. Fly the Commodore spaceship and team up with Thor, Bruce Banner and Valkyrie to take on Hela, her Berserkers and the Fenris wolf in this exciting LEGO® Marvel Super Heroes The Ultimate Battle for Asgard set. The Commodore has 2 dual stud shooters and a minifigure-drop function, while the buildable Fenris wolf figure features posable joints for different battle poses. Includes 6 minifigureswith assorted weapons such as Thor and Hela’s firing Power Blasts to intensify the role-play action. The set includes two buildable items. First you get the giant wolf of doom Fenris who is destined to have a major role in the end of the world aka Ragnarok. The 2nd buldable item is the space craft that is being piloted by Valkyrie. This seems to be a space ship from Sakaar as it does not look like an Asgardian ship to me. It has similar bold colors as the Gladiorial Arena in the first set. Want Ultimate Battle for Asgard? Get it now through Amazon in the link below! 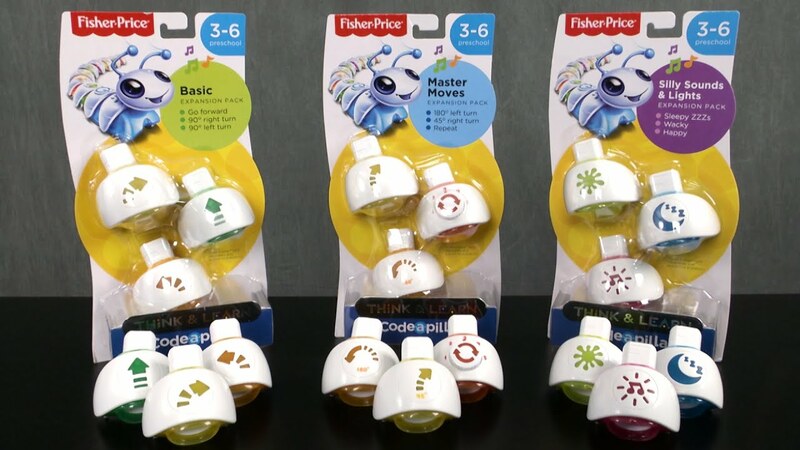 Toylab tries to find the best Amazon Deals by being part of the Amazon Affiliate Program. • Includes 6 minifigures: Thor, Bruce Banner, Valkyrie, Hela, two Berserkers, plus a buildable Fenris wolf figure. • The Commodore spaceship features an opening minifigure cockpit, 2 dual stud shooters, opening storage compartment and a minifigure-drop function. • The Fenris wolf has a buildable head with glow-in-the-dark eye elements, minifigure seat and posable joints. • Weapons include Thor and Hela’s Power Blasts (3 each), Hela’s sword and axe, Valkyrie’s sword and the Berserkers’ blades (2 each). • Accessory elements include Thor’s new-for-June-2017 helmet and Hela’s brick-built legs. • Attach the Power Blast elements to Thor and Hela’s hands and push inwards to fire! • All 6 included minifigures are new for June 2017. • Bruce Banner minifigure has 2 faces—turn the head to begin his transformation into angry Hulk. • Commodore spaceship measures over 1” (3cm) high, 8” (22cm) long and 7” (20cm) wide. • The Fenris wolf measures over 3” (8cm) high, 6” (16cm) long and 2” (6cm) wide. This set shows the scene from the trailer where Thor and Hulk face off in the Grandmaster's arena. It includes the Grandmaster sitting on a throne and Loki who is a spectator. It also includes a Sakaaran guard. 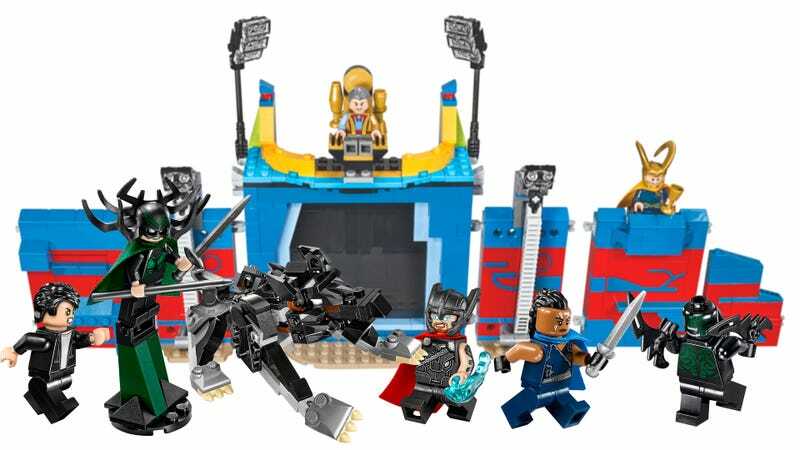 Thor in this set is a bit different than in the past versions of his Lego forms in that he is in Gladiatorial garb and does not have his mjornir. By far the the focus of this set is the Gladiatorial Hulk which looks really amazing with his Hulk sized weapons. Here you can see Grandmaster on his throne as well as a look at the toppling pillars. There appears to be only the walls of the Arena as a buildable structure. This Arena wall includes a black door which may move, lights, and the throne for the Grandmaster. There are some features on the other side of the Arena wall that you can not see in main pictures. The other side features a holding cell for Thor as well as a weapons locker. The Thor figure has a back scabbard for his two swords and in order to fit him in the cell you will need to remove the scabbard. They included a holding peg for the scabbard with the swords next to the cell. You can also see the Grandmaster's Throne from the other side. Want Thor vs. Hulk Arena Clash Get it now through Amazon in the link below! 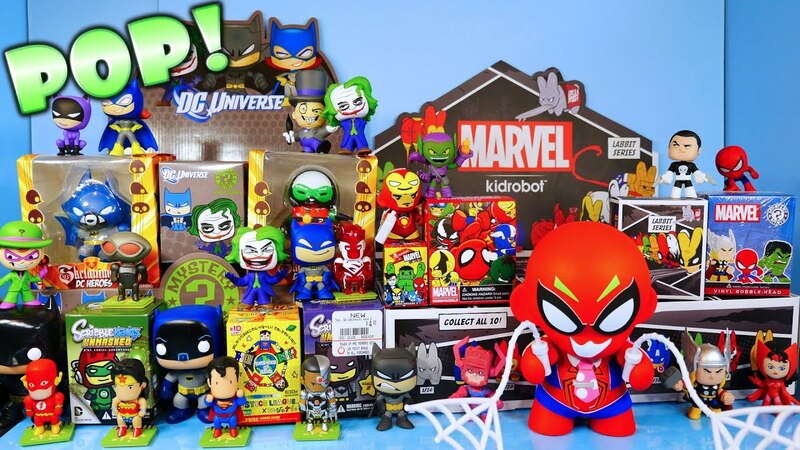 Toylab tries to find the best Amazon Deals by being part of the Amazon Affiliate Program. • Includes 4 minifigures: Thor, Loki, Grandmaster and a Sakaarian Guard, plus a Hulk big figure. • The arena features a sliding gate, interchangeable wall sections, opening wall section with secret weapons rack plus spear, axe and sword, opening prison cell, 2 topple-function pillars with translucent floodlight-style elements, smash-function wall, plus a throne for Grandmaster and seat for Loki—each with knock-over function. • Weapons include Thor’s 2 swords, the guard’s staff and Hulk’s axe and hammer. • Accessory elements include Thor’s new-for-June 2017 helmet, super jumper and sword holder. • All 4 included minifigures are new for June 2017. • Hulk stands over 2” (7cm) tall. • Arena when opened out measures over 7” (19cm) high, 15” (39cm) wide and 2” (7cm) deep. What did you think of the Thor sets? Toylab is a member of the Amazon Affiliate Program allowing us to provide these deals directly from Amazon.